Its a great ride and the first hill you swear your going to fall out. But the Batwing, and the other custom made loops make this ride excellent for riders who love going upside down! 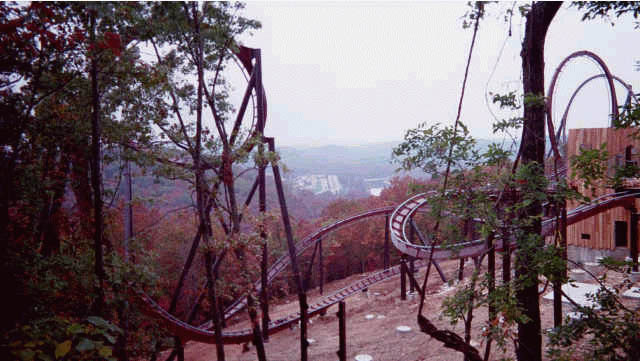 Did i mention the ozark mountains surrounding the ride below? This is an average great steel rollercoaster with great scenery. The only thing i may add is the G-force is a little hard on the body and the breaking at the end may hurt you if you dont prepare your self for it. 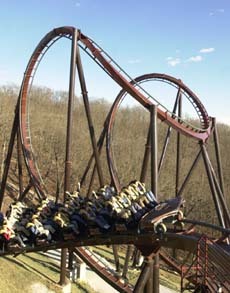 A very nice steel coaster. I was surprised by how smooth it was despite how many loops it had. One of the most unspoken and underestimated B&M coasters in my opinion. This coaster is amazing. The park takes such good care of it. One of the most beautiful coasters I have ever ridden, judging from the view at the top of the lift. The unique sequence of inversions is awesome also.